Pink Champagne is a light pink color with shimmer and even silver glitter chunks that looks so pretty that I want to stare at my nails all day. Its my favorite shade among them all. I love how it qualifies as an office wear as well. Paparazzi Purple is a pretty shimmery purple color with silver glitter chunks again. Wear it at a night out or on a date and you are ready to have all eyes on you. I loved both the shades, so much that I went ahead and bought the remaining six as well. These nail paints are not just another Glitter Nail Paints that are streaky and needs several coats to get an opaque finish, its very impressive. I was surprised to see how they apply so even and smoothly and goes opaque in just one coat but somehow I apply two coats. It dries real quick and gives a matte sand-textured finish. It chips very less and looks fresh even after many days. The only dud is that its a bit difficult to remove it, but then I have figured out, how to deal with it as well (wait for my next post). All in all, with a price tag of ₹125, its a must-have nail paint or if I can say, you must have them all. goes opaque in one coat. Difficult to remove but the Oriflame Beauty Nail Polish Remover removes it effectively. I am quite sure that the Lakme Nail Polish Remover will also do its job pretty nicely. Maybelline Color Show Glitter Mania costs ₹125 and you can purchase it at any Maybelline counter or online. If you think I was inactive on my blog and a bit more active on Instagram, then let me n tell you that I managed to make the best out of my weekend and headed down to Kolkata and met some awesome bloggers and shopped till I dropped. 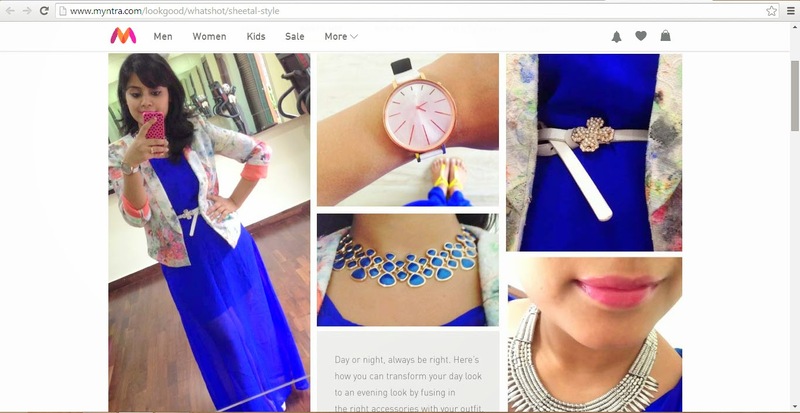 Sometime back I was approached by Myntra and was asked to style myself with at least 1 Myntra product from the website and come up with a fabulous selfie wearing the garment, which would be featured on their Look Good fashion segment and also on their blog. I had received a Rs.1500 voucher from them and choose to buy a Blue Maxi Dress. I came up with a Day and a Night look playing around a bit, with the accessories. I really had fun getting dressed and taking the selfies. To read more about the look do check out their look good section HERE and their fashion blog HERE. Join the gloss revolution! Get addicted to the best of both worlds - Incredible hi-shine of a liquid lip gloss & one stroke application of a lipstick. Introducing Lakmé Absolute Gloss Addict: Created by backstage Experts at Lakmé Fashion Week for Runway-Ready lips in 15 Glamorous Shades! Lakmé Reinvent. Professional High shine in a single stroke application. I managed to pick up only one shade from the store as I was really in a hurry. Though its quite pricey, I will surely pick at least one more lipstick from this range. I found their texture similar to the Revlon ColorBurst Lipbutter and has both shimmery and non-shimmery shades. Also the packaging is really pretty and classy. Hope this post helps you in picking up a shade or two. L’Oreal Paris has come up with their latest make-up collection, L’Or Lumière at Festival de Cannes. Like last year, I have come up with a Red Carpet look which is actually inspired by Aishwarya Rai's look, with few changes. I had made this tiny purchase, almost two months back, from Gia Bath & Body Works which makes these really pretty, awesome smelling, handmade bath and body products.